Today, 86-year-old bluegrass maestro Ralph Stanley announced that he will be embarking on an 80-show farewell tour beginning October 16th. 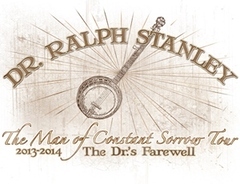 Entitled the Man Of Constant Sorrow Tour: The Dr.’s Farewell, the legendary Grand Ole Opry member will be accompanied by his acclaimed Clinch Mountain Boys, and various country and bluegrass artists appearing as supporting acts. The start of the tour coincides with Dr. Stanley’s 67th anniversary as a professional performer. Stanley began his career in 1946 with his older brother Carter, touring and recording as the Stanley Brothers before Carter’s death in 1966. 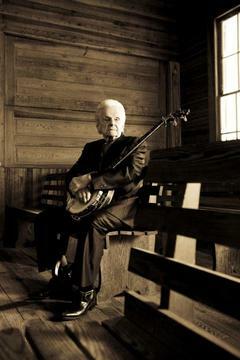 Over those 67 years, Ralph Stanley has mentored the likes of Ricky Skaggs and Keith Whitley, won three Grammy Awards, been inducted into the International Bluegrass Music Hall of Fame, and been a recipient of the National Medal of Arts. And possibly his most crowning achievement was his participation in the O Brother Where Art Thou soundtrack in 2000 that sold over 7 million records and opened the gift of bluegrass to a whole new generation. Stanley’s contribution to that soundtrack was the old traditional song, “O Death.” Though a simple composition, the soul with which Stanley delivered its message is one of the most haunting music experiences a human can encounter. At 86-years-old, the frail Stanley’s best performance days are probably in the past, and as each year passes, he must lean more on his Clinch Mountain Boys to carry the show. But if you’re wondering if it is worth seeing Ralph Stanley on his last go round, I couldn’t encourage it more deeply. Beyond the chance to see one of the very last bluegrass legends from the founding generation of the discipline while he is still around, Stanley still has the ability to deliver those indelible music moments that will linger with you for the rest of your life. Last year Saving Country Music named Ralph Stanley’s live rendition of “O Death” the Top Live Performance of 2012, above amazing sets and songs from generations of talented performers. The live music experience is about memory making, and there’s still none better at making memories than Ralph Stanley. That settles it. 10/20 at the Birchmere. I’m going. Thanks for posting this, Trigger. My wife and I have seen Dr. Stanley several times at the Ryman, and I’ll never forget him standing alone on that stage under a spotlight singing O Death. It made my heart pound and the hair on my neck stand up. Any Nashville folk: he’s playing the Ryman with Jim Lauderdale this July. We’ll be there. Ralph Stanley with Jim Lauderdale. Now I’m jealous. Made me think of this video for the song “She’s Looking At Me” from the excellent album they did together called Lost in the Lonesone Pines. Ralph is a true treasure. To think he is doing 80 shows at his age is remarkable. George Strait only did 26 show this year on the first leg of his farewell tour What a stark contrast. Well there comes a time where you have to retire (unfortunately). Hopefully he finishes his tour and doesn’t end up like George Jones. Looking forward to the tour dates being posted, I hope he comes to Austin! One of my musical heroes I hope he comes thru DFW it will be a must see. I have said a lot of times but folks go see your musical hero’s while you can. The day is coming when the oppurtunity will cease to exist. I read his semi-autobiography a few years back and he sounds like a very tough cookie. I’ve been a fan of his music for a long time, even before I really knew who he was. On a side note: I was looking at buying a Taylor guitar recently, so I went to the most reputable Taylor shop in the state of MN. I played a few guitars, chatted with the owner, and had a good old time. Then a friend of the owner walked in the front door, went straight to the back room, and started frailin’ a banjo with impressive force. He then walked out to the sales floor and he and I started talking. The man I met who’ll be left un-named piqued with interest when I started talking about Ralph Stanley. After a few minutes of me singing Ralph’s praises he looked lost in deep thought. He then started in on a few stories about backing Ralph at a few fests and shows over the years. He was very respectful, but I could tell he was not a big fan of Ralph personally. He told me a story of Ralph showing up very late and very drunk to a show down South in a new baby blue Bentley. The promoter was a little upset, but Ralph wouldn’t have any of it. Ralph said that he was late but he’s here now and he’s going to play. The man telling the story was to play guitar in Ralph’s backing band, so he was tuned and ready to play. The band assembled on stage and Ralph was nowhere to be found. After a few minutes Ralph took the stage without a banjo and played a few numbers. After about 20 minutes he said he was done and walked off stage. The backing band was upset, the crowd was upset but understanding, but Ralph was the most upset. He laid into the backing band for every reason under the sun that it was their fault he quit singing. He had a few other storeis like this about Ralph forcing everyone to call him Doctor, even though he obtained an honorary doctorate. All in all, his read of Ralph was that he had let his success get to his head. I won’t even get started on the stories he had of Jimmy Martin and his temper. That being said, I hope the people get what they pay for, and Ralph leaves a legacy of beautifully timeless music in his wake. I regret that I missed the roots festival last year. Would have loved to see him there + the artist lineup from 2012 was exceptional. This is one tour I wont miss. I saw Ralph a few years back and wasn’t a fan. His son and Grandson did 90% of the vocals while Ralph only did a few songs. The rest of the time was spent with various bad members boasting about all of Ralph’s accomplishments.